On their website is a map showing the high schools that have partnered with CLC. 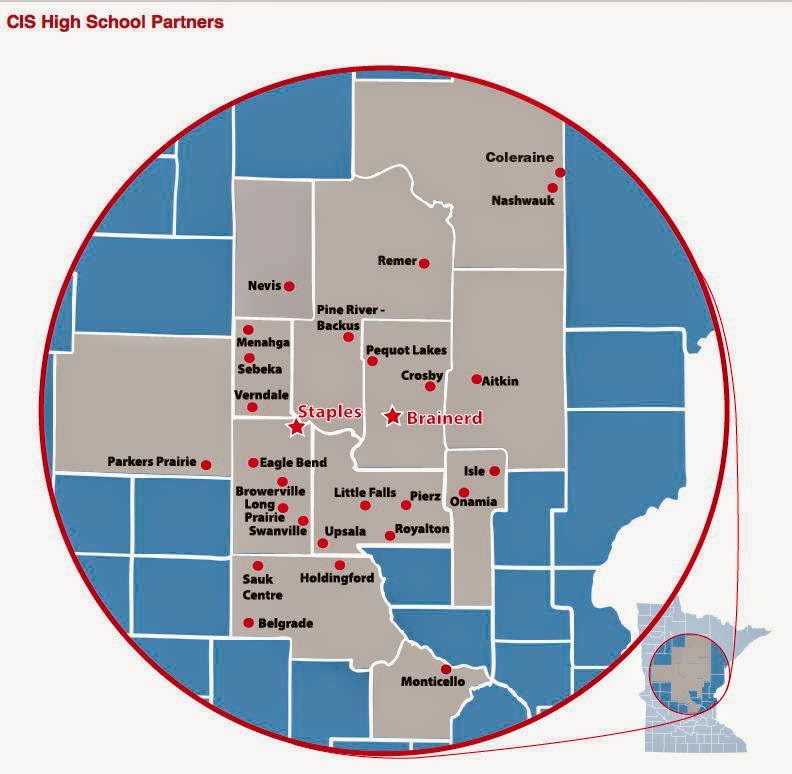 The distances from most of these high schools to either of their two campuses (Staples and Brainerd) are far less than most of the schools that partner with Fond du Lac Tribal and Community College but some are still significantly distant from the Staples and Brainerd campuses. Coleraine High School is 90 miles; Monticello High School is 91 miles, Belgrade-Brooten-Elrosa High School is 95.6 miles, and Nashwauk High School is 103 miles. Thirty high schools are listed on their website as partner schools—although only 26 schools (i.e., ‘dots’) are shown on their map. Additionally, Nashwauk is 15 miles northeast of Coleraine so their map would flunk Minnesota geography. Hopefully, they are teaching world geography instead of Minnesota geography in the high schools. For 2014-15, CLC lists 537 classes of high school CE. For a bit of context, St. Cloud State University (SCSU) after nearly twenty years of experience with CE has only 225 classes. In the 2013-14 academic year, only the University of Minnesota with 12,312 students and Southwest Minnesota State University with 9,051 students exceeded the 6,022 students in CE by Central Lakes College. Again, SCSU only had 5,564 CE students for comparison. Central Lakes College lists 143 teachers of all types. Out of this group, ~33 teachers at CLC are the paid mentors for CE classes. For some teachers, this is by choice, but also because many courses at CLC would not be applicable for CE in the high schools. This data seems to clearly indicate that there are some exceptional teachers at CLC who, while they are teaching a full load of five classes each semester also have the time to mentor and supervise over 40 sections of high school courses. Given the distances involved, it is likely that there is little, if any, personal contact with the teachers or the students in these high school classes despite the expectation in theory from National Alliance of Concurrent Enrollment (NACEP) standards. It is hard to understand how an instructor teaching 4 or 5 courses per semester can adequately mentor more than one or two teachers per semester. CLC must have some amazing teachers because, from this list, it shows that 28 teachers are mentoring 6 or more classes in a year. At one time, SCSU had a faculty member that mentored nineteen sections of CE in one year. However, for that faculty member that was their entire teaching load for the year—they taught no other classes! Long distances from the partnering college/university to the high school and large numbers of classes mentored by an individual teacher makes it very hard to believe that these high school students are actually getting the equivalent education that they would have received had they actually attended the college/university. Unfortunately, in this debate, it seems that the only thing that matters is that high school students can earn their Associate of Arts Degree for free while still attending high school. Too bad many of these students will find out that they actually got just exactly what they paid for.